Quick-Step has been synonymous with perfectly installed floors for years. The secret of this success? Uniclic, an unrivalled technical innovation that lets you install your floor in a tick, without the need for glue. In every situation. 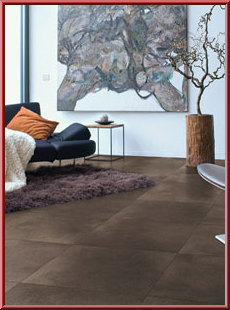 Quick-Step Arte laminate tiles radiate comfort and pleasure. Thanks to Uniclic they can also be installed very fast, without you getting in a mess. The Living surface finish introduces a tangible, deep wood grain structure to the rustic plank floor designs and a natural look and feel to Quick-Step ceramic tiles. Your Quick-Step Arte Laminate Floor Planks can easily be combined with underfloor heating when installed as a floating floor. With possible condensation being prevented by the moisture barrier, this is not possible with fully glued laminate floors. Which means you can enjoy the most beautiful wood floors without having to worry about destroying our forests.